As an editor I want to see constraints violations on Form or Sense statements right after saving them in order to see mistakes in the data and fix them. Right now statements on the Form and Sense level are not checked for constraints violations when saving a statement. When a statement is saved and the gadget makes the action=wbcheckconstraints&claims=… request, the API returns constraint violations (that part actually works), but the results don’t become visible on the page. The gadget’s DOM selectors probably need to be massaged a bit. CommunityTechBot renamed this task from m3baaaaaaa to Insert results of constraint checks on form/sense statements in page. 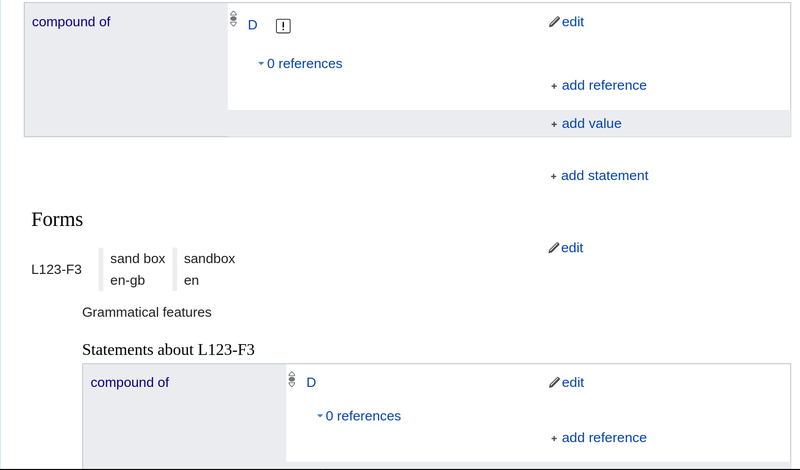 WMDE-leszek moved this task from other stuff to features/bugs for next release (editor experience improvements) on the Lexicographical data board. Tarrow moved this task from To Do to Doing on the Wikidata-Editor-Experience-Improvements-Iteration8 board.